I was recently driving with some friends past the location of the old Park Royal Hotel in North Vancouver when a big grin crossed my face as we pulled up to the intersection of Marine Drive & Taylor Way. “What’re you smiling about?” prodded one of my buddies. “Do you guys remember Frank Baker’s Attic restaurant that used to be over there?” I replied. Perhaps because they were too young or hadn’t grow up in Vancouver, but none of them knew what I was talking about, and that made me sad. Trips to Frank Baker’s Attic were some of the most fun I ever had at a restaurant and some of my fondest early dining memories with my family. We moved west to BC from Manitoba when I was a boy. It was the mid-seventies and we were a young family struggling to make ends meet and the move was a huge opportunity for us. There wasn’t a lot of extra spending money, so most meals were spent together at home. Rarely, and only when my sister Terri and I promised to be good (which we often weren’t), we’d get to eat out at a restaurant with mom and dad. And we loved it. But the best treat of all, after church on a Sunday, was when on the way home my parents would exchange a glance in the front seat of our gigantic brown station wagon, and with a wink my dad would say “Hey kids, wanna go for a drive?” Pure joy. “A drive” was a special family tradition for us. Sometimes it meant we’d grab burgers and wander about looking for garage sales on a sunny afternoon. But on special occasions it meant a trip to Frank Baker’s and a tour of the British Properties in West Vancouver where we’d look at the houses and dream of living in those beautiful big homes. These were epic adventures for Terri and I. From the back seat of that growling beast of a car we’d watch the world go by. We’d marvel at travelling over not one, not two, but THREE bridges, the last being the impossibly large Lions Gate Bridge spanning the Burrard Inlet, connecting the mysterious Stanley Park to the north shore and West Vancouver. We’d pull into the parking lot of Frank Baker’s Attic and Terri and I would be off running before the car had stopped. “What’s a smorgasbord mommy?” I asked inquisitively, thinking it was another of those strange German words (turns out it’s Scandinavian). Her answer will stay with me until the day I die: “It means you can eat as much of anything as you like dear.” Wait, what? Was she serious? Those were dangerous words to say to a hyper-active, food-processing machine called an eight year old. Frank Baker’s Attic was big. No, check that, it was huge. I read somewhere that it had 1,200 seats in it, but in my childhood head it may as well have had 5,000. And somehow it always seemed crowded, filled to overflowing with noisy throngs of happy diners—many of whom likely also drove from parts unknown to take in the cacophonous atmosphere and eat their fill from the long tables covered in a buffet spread hard to accurately describe. If I close my eyes and try to conjure images of the food at Frank Baker’s Attic I see giant bowls of meatballs, rows of bright yellow and white devilled eggs, cold cuts for miles, pyramids of freshly-baked dinner roles, platters of bacon-wrapped scallops, and great, big mounds of prime rib glistening under heat lamps, jiggling and oozing red liquid as the chef cut off thick slices for me—as many slices as I could want! And horseradish? What a delight! It was at Frank Baker’s Attic that I first discovered many foods and flavours I’d never experienced back in Manitoba. This truly was a burgeoning Foodist’s playground. But amongst memories of food flash odd images and quirky recollections, like that of a Dixieland band that would suddenly start playing, with Frank Baker himself wearing his trademark white suit joining them on trumpet, loudly playing When the Saints Come Marching In as they marched through the crowd, grabbing patrons (especially eager kids like us) to follow behind like some sort of congo line. It was hilarious fun. I recall the room filled with brightly coloured, strange lampshades that gave the entire place a feeling of some creepy old lady’s parlour or something (turns out Baker was an avid collector of antique Tiffany lampshades). I remember my mom laughing hysterically when she lifted the leaf covering the privates of a statue of David, only to jump back in fright when an alarm buzzed loudly, making her turn red with embarrassment. That was Frank Baker’s—always filled with laughter. Certainly for a young boy my age, the most amazing thing about Frank Baker’s Attic was the car. That’s right, the car. I would drop hints and make special requests to go back to the restaurant just so I could stand and stare at James Bond’s Astin Martin DB5—who some claim is the most recognizable car in the world. I couldn’t believe that the very roadster Sean Connery drove furiously in Goldfinger, with its ejector seat, pop out machine guns, and bullet shield behind the rear window was right there in front of me incased in glass (it wasn’t until years later that I realized it probably wasn’t even the actual car used in the famous scenes in the movie). As compelling as the joviality and gluttony happening in the dining room was, I couldn’t wait to be excused so I could go out front and stand at that glass, my imagination running wild as I pictured scenes with bad guys chasing 007 as he narrowly escaped through a combination of skillful driving and the gadgets installed by Q. Mesmerizing. After jotting down some of these memories for this post I did a quick Google search to see what I could find about Frank Baker’s iconic restaurant and was disappointed how little info I could find. Luckily I did stumble across this short documentary video about Frank Baker by a VFS student from 2003 with footage from the 1980s, but it paints a bleak picture of the restaurant’s slow demise and the decline of Baker’s health. Frank Baker’s Attic is long gone now (Frank died years ago), but the memories of those family adventures on Sunday afternoon drives will remain in my mind forever. And the eight year old who still lives inside me is grateful for them. The man with the horn was Frank Baker, a restaurant owner of that long-vanished era when “fine dining” meant a T-bone steak, three double scotches and a pack of Chesterfields. Mr. Baker, who died in 1991, had once owned a “swinging” kind of restaurant in West Vancouver where your parents would take out-of-town guests, but only after first getting themselves all revved up with Herb Alpert records. 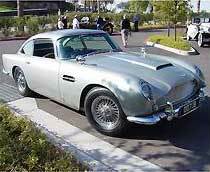 Mr. Baker was always, to younger eyes, the embodiment of a certain type of cool, so cool that he had even bought the original Aston Martin DB-5 used in the James Bond movie Goldfinger. He was certainly a character, and his restaurant was an occupational puppy mill for a good number of friends during high school who bussed there and diced the vegetables and did food prep on weekends. As I recounted these memories to my friends that afternoon, it occurred to me there are so few of these type of restaurants left. And very few neighbourhoods like those in West Vancouver too. Fewer still are the flamboyant, eccentric restauranteurs like Frank Baker himself. In fact, I can’t really think of any at all…anywhere—can you? Wow! Did that ever just rocket me straight back to climbing into the metallic green Matador with my siblings as dad took us out for lunch to see the James Bond car! I got goosebumps recalling the family outings up there! Very hard to believe how much time has passed. Growing up in Vancouver and then North Vancouver I frequented Baker’s Attic as a child and then as an adult and ended up with my dates their frequently. I too remember when Frank bought one of the many Aston Martins used in Goldfinger I believe. I read somewhere there were six or so used for the movie. Thanks for the story and pictures Mark. ps. Dal Richards would also show up sometimes as memory serves. Brings back so many fantastic memories. I thought I was the only one alive who remembers Frank Bakers Attic. So many happy, funny times…we should have a Frank Bakers Attic reunion. I got to sit in that car once. I was a teenager then and at a private party held there. We razzed him till he finally said ok let’s go and he took us and let us check out the car till we got tired of it. Had many, many good times at the Attic. I could go on and on. WOW i have tears in my eyes reading this. Dad would drive us up from Kitsilano and my little sister and I would do all that you said you did too.I recall the buzzer when the ladies would lift that leaf and everyone in the restaurant would know what they did in the washroom hahaha. Those sure were the days. Hmmm i miss all that, and my dad. Trip back memory lane. I bussed there as a teenager. It was a right rolicking place, full of staircases, little rooms, and, of course, crowds of people. Frank often sat back, watching the action, nursing a scotch and soda. 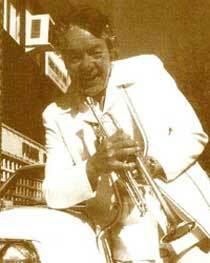 Every now and then he would pull out his diamond-encrusted trumpet and, man, that guy could blow! Towards the end of the evening the (usually rather large and kind of going to seed)cabaret lady would sing “Show me the way to go home.” The signal for the regulars to toss down their drinks, and make their way to the door. My wife and I got married there in April 1979…Fantastic memories, drove past the place where it used to stand just recently, with two of my daughters! We are from So. California. We took a trip up to BC in our camper in 1974. Our older son, Brian, was 4 at the time. We camped on Vancouver Island and went salmon fishing and clam digging for a week. Then we took the ferry across to Vancouver. A local guy told us that if we wanted to experience real Canadian fun and cuisine to go to Frank Baker’s Attic. We took him up on it when we got there. What an incredible place. The whole upper story glowed from the ceiling of Tiffany chandeliers hanging there. Then we were told that the floor lamp on the band stage was a real Tiffany, valued at that time around $40,000. We were told that when Frank found that out, he had the lamp bolted to the stage. Being antique collectors, we absolutely loved that every table and chair, and every place setting and plate and cup was antique and completely different. There wasn’t a place setting that matched in the entire place. The salmon was delicious. The show was so much fun. Our four year old got out and marched with the band all around the restaurant and through the kitchen. He still remembers it to this day. I am so sad to hear that it no longer exists and my son cannot take his children to see it anymore. What a loss for all of us who remember it! 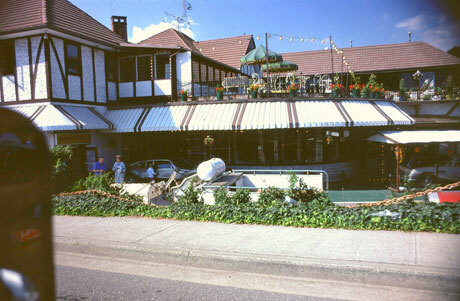 I grew up in Deep Cove and going to this restaurant was brilliant! I remember being able to have as many desserts as you wanted. For a kid that was those beautiful fancy parfait glasses filled cubed jello in every color, topped with Cool Whip and a maraschino cherry. Luxury! Imagine, I could have as many as could eat? Incredible! This is great for memories ! I worked at the Attic from 1972 until 1976. I worked with Charles Evans and Frank Baker and many others ,,,,it was fun place to work and the tips were great. I got a ride in the DB-5 one day when the guy that came to tune it up took it up Taylor Way along the Highway , down Cap Road and along Marine back to the Attic. We have many celeb’s show up at the the Attice as well, Liberace, Phyliss Diller, Cheif Dan George ,,,even Jimmy Pattison came in all the time,,, then after Charlles Evans passed away Frank made some bad hires and they ripped him off !!! Frank Baker -There is a blast from the past! we were neighbors of the Bakers many years ago and what I recall about him is when he made an ice rink on his patio for the kids. I dont mean just for his daughters. Frank made it for all the kids in the neighborhood. Very decent man.Actually all of them. Great neighbours. I remember the car as well. We never ate in the restaurant though. Was a buzzer and light hooked up to the leaf? I had only heard of a light that flashed above the outside of the bathroom door. Someone should dig through some newspapers, magazines, and books and create a wikipedia article on Frank and the Attic to preserve the memory of it. I have the same fond memories of FBs. Unlimited dessert! He also had a second car with a living room and TV in the back. Can’t remember what it was. Also remember the Town Pump as a resaurant, and cooking my own stake at Kejack’s on Main as a family treat. Went to the old spaghetti factory in gastown and it has hardly changed since it opened in 1971. Ah memories! I used to work at the Taylor Way Home Service next to “The Attic” and had the honor of parking Mr. Baker’s white Cadillac after I filled it with gas and cleaned all the window etc. I spent many an hour just staring through the glass at the Aston Martin, and the Toronado, not to mention climbing on the old fire trucks. he was a great guy. Yip that kind of restaurant is gone too. He used to make all the guests line up and march through the kitchen to see how clean it was. He played his trumpet and told jokes the whole time. What a guy! As a boy I worked at the Taylor Way Home Service gas station next to the Attic. Mr. Baker used to drive into the gas station, get out of his big car, and go next door to his restaurant. I had to fill it up, check everything under the hood, and clean everything from headlight to tail lights. Then, I had the honor, as a 15 year old boy, to driver his big white Cadillac convertible over to his parking spot next door, right beside the Goldfinger James Bond car. I spent a lot of hours just looking at that car. Wow! I did that twice a week for 3 years. In those “good old days”, I made $1.75 an hour, and averaged $5.00 per day in tips. I don’t remember any of that from Frank…now that I think about it. I am sure to be wrong as he was an incredibly nice man. With the exception of my dear old Dad, they didn’t come much finer. We miss you Frank! When I think back on my childhood happy times that stand out the most and one of them is of me standing there for what seemed like hours staring at the James Bond car. Yeah yeah dinner was great but the car and Shirley Temple drinks. My little sister and I would order Shirley Temple after Shirley Temple. I would constantly ask to go back out and look at THE CAR. Awesome post on Frank Baker’s Attic restaurant! It brought back fond memories of the 80’s going to The Attic. I remember going to Frank Bakers as a child when my parents drove up from Renton Wa. It seemed so big to a child under 13. The miles of food, desserts on trays and carts and also the barrel of afterdinner mints by the cash register counter. My boyhood memories of Frank Baker’s attic include many Sunday bus excursions with a friend from South Vancouver to Stanley Park and a walk across the Lion’s Gate bridge to our final destination : The $2.00 children’s smorgasbord at The Attic. Our first stop once off of the bus at Stanley Park was the Texan Burger on West Georgia to get one or two of their 5 cent soft ice cream cones! Then on to Frank Baker’s for our reward for having walked for a few kilometers to get there. Lunch was always satisfying, with a great variety of food and deserts. We usally waddled out of there with barely enough energy to walk back across the bridge to the park and to the bus loop at Lost Lagoon. It was a sad day when the restaurant closed! My memories exactly, only my family would only go on New Years Day for dinner. Coolest place ever when you were a kid, and I’m sure the adults liked it too. I’ll never forget the multi-coloured sugar. His beloved wife Dorothy passed away on Friday August 5th, 2016. With my husband Sandy we sold this car to Frank on condition that he didn,t drive in on the road. We delivered it to Frank in Vancouver and had great fun with him and Dorothy. I remember he had a motor boat on the Hudson Rive” and made a lawn on the deck. Did he have any surviving children? Thank you so much for all this information and going down memory lane….my husband and I young married couple 1971 from Kamloops and just moved to Vancouver and going to the Attic was fantastic…everything about it, the food, the car and the atmosphere….just loved it. Grew up in North Vancouver during the ’60’s. Never ate in the restaurant, but stared at that DB countless times.